The Wicked Lovely series by Melissa Marr sets up the intriguing premise of a girl who discovers a fey world hidden in the ordinary world around her. As the books progress, the mortal girl Aislynn falls in love with Seth, her mortal boyfriend; she pledges to rule the faeries as Summer Queen with Keenan, the tragic Summer King; and then she has a hard time choosing between her destiny and her heart. Along the way there are long and tedious side trips with other characters who play roles with varying degrees of importance in the overall structure of the fey world. The books are very popular, which might be due in part to gorgeous covers and a love triangle which includes an attentive, pierced and tattooed boyfriend. Is it really a triangle, though, when one party really is just trying to do his duty? 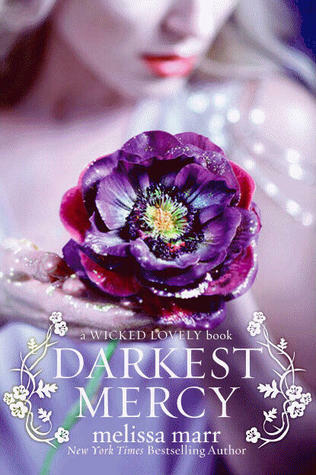 Darkest Mercy, the fifth and final book in the series, resolves the issues that have been pending and prolonged for so long, though I’m not sure it’s done in an entirely convincing way. Rather than arriving at a conclusion on her own terms, the choice Aislynn makes to determine her future is forced by Keenan, and it’s hard not to think that he could have just issued this ultimatum back in the very first book. The books aren’t hugely complex in the way they are set up or in the issues they address, and characters often seem to drift from one lot in life to another with very little fanfare or emotional consequence. Part of the reason why I have a hard time with YA books about faeries in general, however, is that so many of them seem to spend a great deal of time mulling over the politics of the faery court. Think of the Star Wars prequels and those endless Senate Council meetings and you pretty much have the idea how things play out in most books about the fey, including the Wicked Lovely series. Power struggles and maneuvering would be fine if they were balanced out by continued strong character development and action sequences, but as far as this series is concerned, there’s a lot of talk but what interesting action and development there are could easily have been condensed into one or two books. I read all six books with the hope that the promise of the series’ premise would be fulfilled, but for me, it was an unrewarding and ultimately unfulfilling exercise. 30-second summary: Concludes a long 5-part series with an ultimatum that could have come much sooner. Contains wicked faeries who drone and pine for hundreds of years and pages, as well as intimate (though non-explicit) situations. Haven’t even read “Ink Exchange” need to crack down and read! Great Review… I thought i was the only one who didn’t agree with the end of this series.